If you live in Colorado, and you want to keep bees, the Bee School put on by the Pikes Peak Beekeepers Association is awesome. For what they’re charging, I’d consider adding a hotel bill if you’re travelling from a distance to still be a fair price. It is two days and a ton of information. They encourage questions during the breaks and make it very clear that they will be available for more questions as the season goes on and we get our own hives and colonies. The day started off, as they do, with some basic housekeeping information. There were two points that stuck out, though. The future of beekeeping is not one beekeeper with many hives. It is many beekeepers with one or a few hives. It’s much more stable that way. The other is that in Colorado Springs we can expect to lose 15-20% of our hives annually. In California, the expectation is 20-50% of the hives. Plant flowers and stop using pesticides, people. We are not ready to see what happens if the bees disappear. The history portion was fast, but it was enough to whet my appetite to learn more. The oldest recording of stealing honey is 15,000 years old. The Egyptians moved their hives for pollination purposes. Current bee laws are based on Roman bee laws. Finally, the honey bee as we know it arrived in America in 1622. It was dubbed the “white man’s fly” since the bees tended to precede the arrival of the white man in a given area. However, beekeeping couldn’t be really commercialized until L. L. Langstroth, the father of American beekeeping, came up with the Langstroth Hive in 1860. The standardization and ease of access to the hive made it possible to do on a large scale. The next portion was talking about the agricultural benefits. Did you know that it’s a $200 billion industry world-wide with the worth in the US being around $20 billion? Of course, when 1/3 of our food depends on these little animals, it becomes less surprising. Though more disconcerting when you consider their fragility. Bees aren’t just good for food, though. There are 7-800 conditions listed in the Egyptian Papyrus Ebers. Half of them include honey in their treatment. There’s more to honey’s health benefits than just help with allergies. Even propolis, bee glue, seems to have health benefits as an antiseptic, antibiotic, and even an antiviral. There were examples of the necessary equipment that were passed around for us to handle. During that lecture, we also got to hear anecdotes about things that were learned the hard way. This was when we were told that if you ask 5 beekeepers the same question, you will get at least 6 answers. There is a lot of science involved, but there is also a lot of art. Once you have learned the basics, it is up to each beekeeper to learn the ins and outs of their colonies and the areas where their bees are kept. Currently, each plot in Colorado Springs is legally allowed one hive, assuming your HOA doesn’t object. They are working on getting it back up to two. That way if you lose one, you’re not out of bees until the new one is established. If you live elsewhere, though, check your local laws. Just down in Fountain, you can’t legally have a hive unless you have at least an acre of property. Of course, if you’re planning to flaunt the law, keep the neighbors well bribed with fresh, local honey. Did you know that the queen bee rules, but she does not reign? It is the worker bees that determine when she needs to be replaced and they are the ones that choose the worker eggs to turn into little queens. Of course, once the first queen emerges, she promptly stings through all of the other queen cells to remove any potential rivals. The workers also take on every job in the hive at some point in her life. Did you know that when a bee colony is searching for a new home, they make decisions as a group the way our brain makes a decision. There was a Nova show on it. Basically, they do their waggle dance to tell their sisters the good news, but they aren’t above whacking a sister who is waggling for a different destination. In the end, whoever has the most interested sisters wins the vote. It seems that neurons in our brain send positive and negative signals to waggle or whack to influence the vote in the direction they want. Who knew? The class on hive assembly just talked about the Langstroth Hive, as that is what 90% of the beekeepers use. There are other options, like the Kenyan top-bar hive or the Warre top-bar hive, but they don’t have the same following. At least, not yet. I am starting with a Langstroth Hive, since I can easily get my hands on a kit, but I think I will eventually have at least one Warre hive. The Kenyans are more of a warm-weather construction and probably won’t do as well in our cold winters. We watched a video on how to move your bees from their shipping package to their hive. It was helpful to see live bees being handled. I think that will make it a little less intimidating when I get my own buzzing box. A little. After the film, though, the instructor went through a couple of points of disagreement (we don’t need to medicate them- it’s been handled before they shipped) and some Colorado-specific points. Don’t do it on a windy day. They’ll blow away. When it comes to managing our bees, we need to think of ourselves as bee assisters rather than bee keepers. The bees do 99% of the work. We just need to keep an eye on them and help out if they need it. In fact, our only job during the first summer is to feed them and make sure they’re strong enough to survive their first winter. Once they are an established colony, though, handling them is far from a daily task. However, when they are handled, don’t forget to forgo your perfume, aftershave, or scented deodorant. They will try to figure out what kind of flower you are and if you’re good to eat. The rest will need to go in a second post, as this one is getting a bit long. I really need a potting shed. On the other hand- it’s nice to sit inside and watch a movie when it’s snowing outside on a planting day. 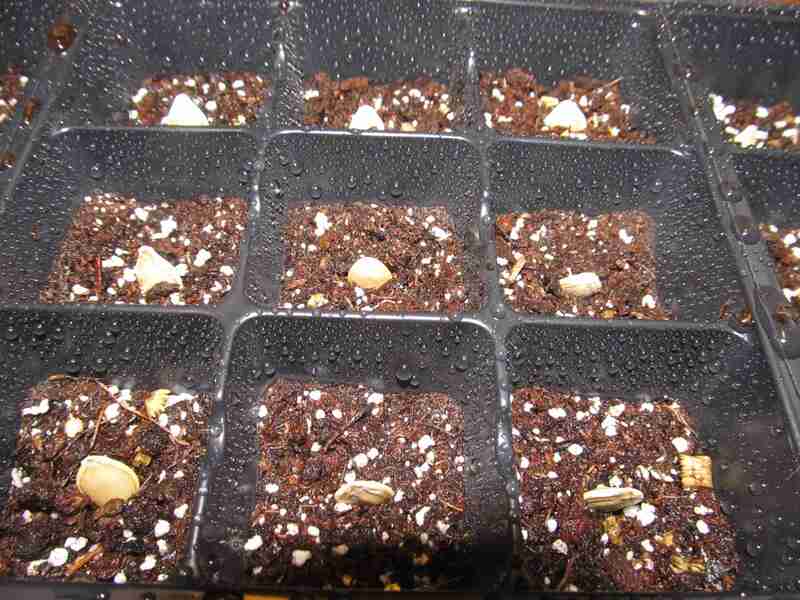 On March 11, I started my second round of seeds. I also repotted my first round of young plants. I still have a lot to learn. I have been interested in the idea of starting my own seeds for a while. It’s less expensive than buying plants, and you can grow more exotic varieties. 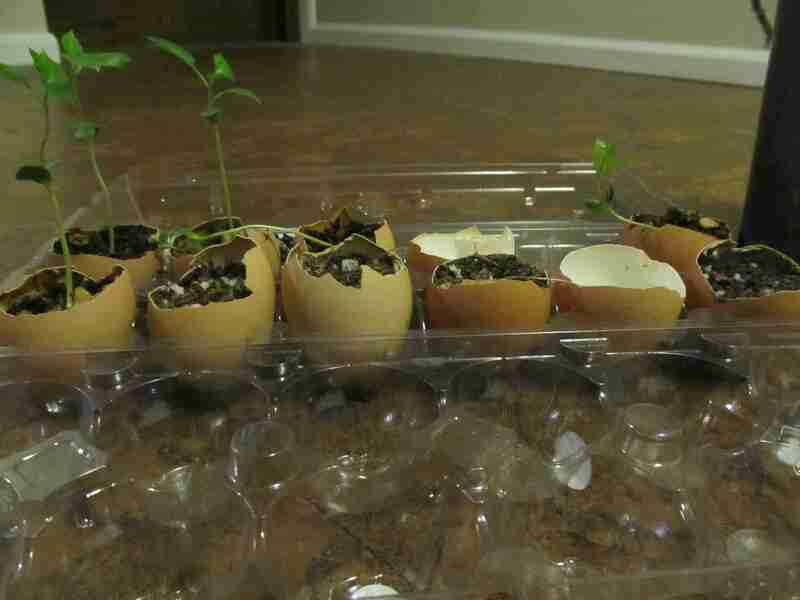 It’s also the only way to grow things like tomatoes from seeds you have saved. However, it can be a bit pricy to start. There isn’t a single south-facing window in this house, and I’m not sure we’d get good light even if we had one. That means I have to buy and somehow set up grow lights. The house isn’t kept all that warm, since it’s more energy efficient, but that means I really need a warm spot to help the initial germination. I also needed to buy a couple of seed-starter flats along with starting medium and potting soil. The lights in particular add up fast. Squash seeds are so much easier to photograph than tomato seeds. Too long in the starting medium plus erratic watering means that I don’t think all the squash will make it. Don’t start small perennials and large annuals in the same flat. You have to raise the light too fast for the perennials to keep up as they are slower to germinate and, in my case, just shorter. Water daily. Check on them at least twice a day. Once they flop over, they may not recover. Have enough lights to give even light to all of the plants. More plants means more or bigger lights. If you write out a schedule, mind it. Don’t wait too long to transplant out of the starting medium. It doesn’t have many nutrients. If you live with a dog that eats anything and your potting shed is the living room floor- make sure you don’t have to dash to the store for more potting soil in the middle of the planting project. Make sure you have enough pots for all of the plants. Start more than you need. They won’t all make it. Just because the top of your seed-starter is all fogged over, it doesn’t mean the soil is all evenly moist. Lable! New England Sugar Pie and Watham Butternut look a lot alike until they set their fruit! 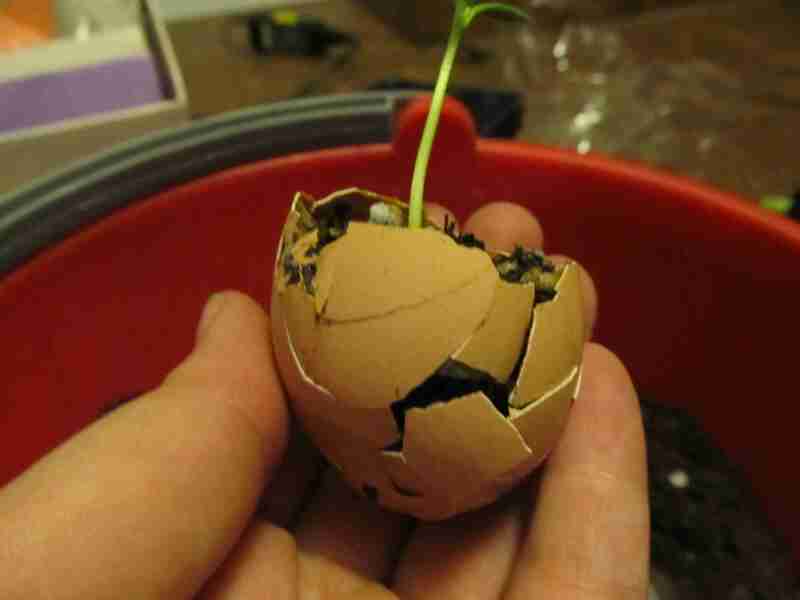 Apple trees start pretty well in egg shells in the fridge. I am starting plants on the early side for two reasons. One- we have a short growing season and I want them to have as many productive days as possible. Two- people like to buy bigger plants, so bigger ones should sell better. To set up my schedule, I went by the days to maturity for each variety. It broke them up nicely into a logical progression. The first to go in were squashes. The last will be my peppers. Tomatoes happen in between. Things like herbs and flowers can be started on a less stringent schedule, so they can be fit in around the food plants. Gently crush the shells so the roots can grow through. Starting them this way leaves a calcium source right at the roots. My squash went in right on schedule in early February, sharing the flat with some chives and calendula. I think the chives will be ok, but the calendula are so leggy that I don’t think many, if any, will recover. I’m going to need to just try them again. The round currently sitting on the heater should have been planted around February 25. Being two squash and two tomatoes, they should grow at a similar enough rate to share the flat. The moment they’re well enough sprouted to go under lights, I need to plant the round that should have gone in around March 5. If I’d done them as planned, it would be much less rushed. However, scheduling them as early as I did also gives me some leeway for being slow. The last round will also be a bit behind, as the heater won’t be ready by March 19th. If I get a chance, I also want to do a round of herbs and flowers sooner rather than later to give them a decent head start. 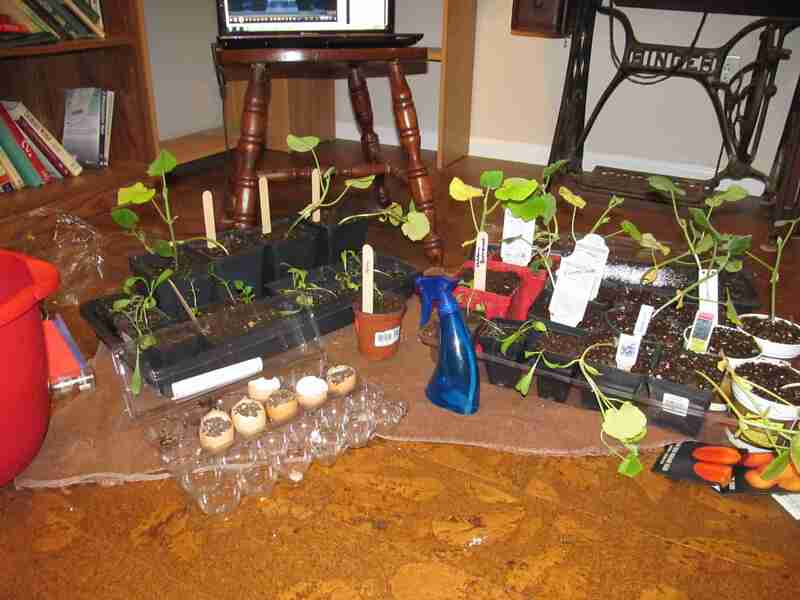 Before my next round of transplanting, I need to do a bit more planning. 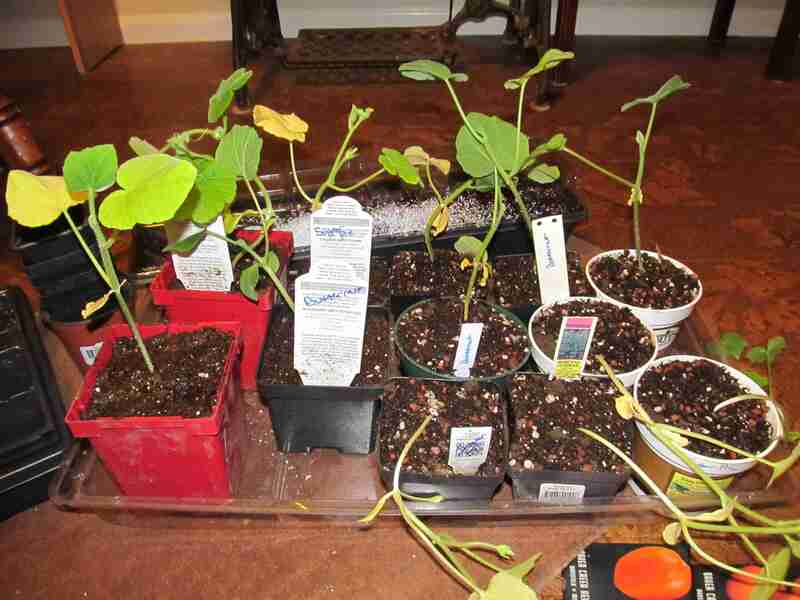 Specifically, finding a bunch more pots for the 36 seedlings that will need a new home!